You'll never guess where I was surfing again? Pinterest did you say? You guessed it!! I found a very fun card to make using the "Gorgeous Grunge" set. I just can't seem to get enough of that set! It's fun and different. I LOVE that combination! You can see the original card here. And as usual I did change the card some. 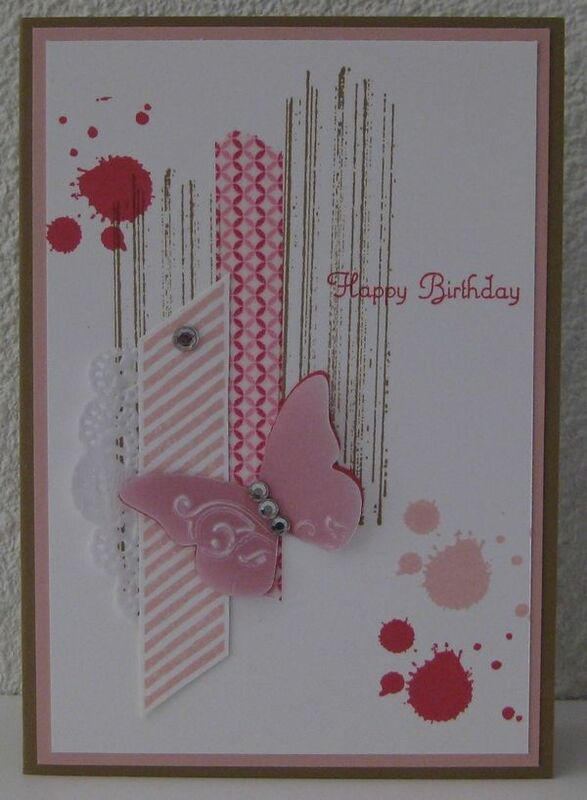 The original card has a butterfly on it instead of the hearts. The plan for my card was for it to be a Valentine's Day card. Not to say that the other card wasn't pretty, it was VERY pretty but it wasn't what I was looking for. So I just copied it as close as I could and then added the Valentine's Day theme to it. I like both cards but this one I have a use for! This would also make a very pretty Mother's Day card too! This card has some fun elements to it. I used gold embossing powder on the "Gorgeous Grunge" line images. It's got a little piece of the paper doily on the left there. It's got a couple of rhinestones, the Washi tape, Real Red and Pink Pirouette ink splotches using the "Gorgeous Grunge" set. And the words are from the "Teeny Tiny Wishes" set. I'm hoping very hard that the set doesn't retire. I LOVE using it and it has a lot of occasions in it. Though I think I will use it even if it does retire.